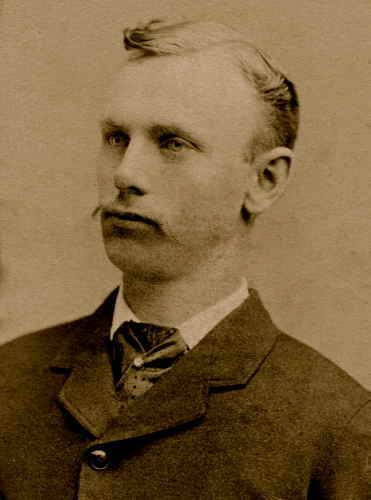 Wilbur Fiske Ellsworth was born in Ipswich March 30, 1843, and served for many years with the Ipswich fire department. He was the fourth son of Benjamin N. Ellsworth, the esteemed Ipswich lightkeeper, and was the brother of Civil War hero Thomas Ellsworth. Wilbur Fiske and several other people in Ipswich succumbed to an epidemic of pneumonia that swept the town in 1898. Wilbur married Elizabeth Lord, the daughter of Mr. and Mrs. Eban Lord. They inherited the Lord Farm at the intersection of Pineswamp and Linebrook Roads in Ipswich, now the location of the Catholic Church. Thanks to Laurie Short Jarvis for this information about her great-grandparents. The old Lord / Ellsworth farm at the intersection of Pineswamp and Linebrook Roads in Ipswich was demolished many years ago.